There are more and more ladies opting for short hairstyles and when it comes to picking the most outstanding bridal hairstyles, some of them seem to be facing a serious problem of opting for a suitable look with their short hair. This is also one of the main reasons why many others don’t risk going for short hairstyles, because they’re not sure of being able to create some effective festive ‘dos with them. Still, it is, in fact, possible, and there is even a big range of options that a girl may opt for creating looks for such important days as weddings. That’s what we are going to speak about right now, introducing some cute bridal hairstyles for short hair, with the help of which you can create great bridal looks. One of the most important rules that you need to know about short bridal hairstyles is that you need to take care of every single detail when getting ready for your wedding. Those details include hairstyles, the overall inclinations and vibes, and the main accessories from which you are going to pick one. In addition this should be done long before the day not leaving everything for the last minute. In order to pick the most effective ‘dos, you need to start with figuring out your hair type and condition it is in. Split ends, excessive dryness or oiliness and hair loss are all problems that need to be eliminated some months before the occasion. Besides, you should also pick the image you want to have for that day and be wise when making decisions. You should be sure and careful about the choice of the dress, the bouquet of flowers, the accessories you will pick, the existence or the absence of the veil, etc. The harmony of these details is no less important and you certainly can’t match a romantic image with a weightless dress with some effortlessly styled and uber-voluminous ‘dos accentuated with wax. On the other hand, you can’t experiment with the combination of the non-classic dresses of non-classic shades with some gentle and soft ‘dos with wavy textures and tiaras. The next thing that you need to pay attention to is your facial features and their compatibility with a certain type of hair and makeup accents. For instance, if you want to put an accent on the lips, you can complete your hairstyle with bangs, even with artificial ones. Whereas in case you want to emphasize the features of your face in general you can pick options like the ‘dos opening up the face or those adorned with cuts, in case of which the side line doesn’t reach the ear. Features like an eye-catching nose can be nicely accented with ‘dos like bobs, complemented with chopped bangs and overall asymmetrical touches. Balance is the following thing you should consider. When you get done with the preparations and look into the mirror, you should see a harmonious image. If your eye is caught by anything for too long, and especially if you’re not pretty happy about it, then there’s something wrong about it. The proportions of the pieces and details are also important thus not allowing combining the curvy figure with voluminous dresses and completing that with some ultra-short ‘dos. This is an evident don’t for you. The same can be said about thin and slim brides as well. If they go for the mermaid type dresses, combining them with some voluminous and high ‘dos doesn’t create the greatest effect. This type of hairdos is especially suitable for those, who are planning to have a ceremony in the church. In addition, they are an ideal way of completing the romantic and classic image of any girl. If a long veil is your choice, you should match it with similarly designed flowing silhouettes for dresses, while trying not to have any special accents on voluminous ‘dos. Alternatives like hair teased back and adorned with wavy finishes joint in a pin are ideal. The fixation of the style can be secured with not much proportion of hair styling products like gels and sprays as well as wide pins matching the shade of the hair. If you want to hide your wide forehead, hairdos with thick and straight bangs or other forms like asymmetrical alternatives can be the best choice for you. You can also create some imitated bangs, using some strands of hair from the back, taking them from one side to the other and getting them run through the forehead. In addition, you can also decorate such ‘dos with tiny floral details or with a headband putting them on the very place where the veil starts. If you have a bob or other cut of this type, you can also go for more sophisticated options of hairstyles. For instance, you can use the Greek style for your hair not forgetting about the headband. The latter is also picked according to the overall tones and styles of the dress and the accessories. • The very first step is picking the headband and securing the necessary section of the hair inside and behind it. • The hair left on the nape should be gathered in a bun using chignon if necessary, which will add some volume to the look. • Finally you need to secure the veil right where the bun is, without using any extra details since the headband covers all the space for that. Another cool option especially recommended for girls who have a round face is the retro style of the ’20s Hollywood looks, coming with curious and chic waves, also characterized by better fixation and the overall simplicity, not requiring any other accessories but the the veil, which can also be replaced with the birdcage type for maximum retro glam and charm. What you really shouldn’t do on a wedding day is opting for artificial braids, which will have the biggest part of everyone’s attention and will overshadow the great work of the hair stylist. That’s why the classic texture without any extra details is the best way out. The following range of ‘dos you can consider is that without a veil. This is a more versatile and permissive array of options, enabling you to have more types of experiments and innovations. You can include details like pearls, flowers, headbands of different types, tiaras, jewels and much more. Still, you again need to preserve the exact limit of these elements trying to concentrate on one type only. 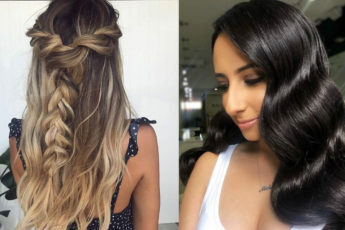 For non-standard occasions in case of which you are not required or do not plan to have a voluminous dress, you can go for the revolting and bold image with some ultra-short hairstyles, sectioning a part of the hair with wax and teasing the hair on that part to have significant volume. Or else you can create the wet hair effect, for which you’ll also need to style the hair with your fingers, using special gels. Still, for the top experimental and classic combos like those including pants (yes, pants! ), you can pick bobs or asymmetrical ‘dos with ideally straight and shiny locks and straight bangs too. You don’t even need a special ‘do here. All you need to do is to just carefully fix the texture and the look you’ve got. Bridal hairstyles with short hair are sometimes even a more creative and cool alternative for ladies, who really prefer such creative looks to those created with long and lavish locks. Such variants will economize their time and efforts and will decrease the level of panic, if the bride knows how to style her short hair correctly. Besides, the risk that the ‘do will get spoilt because of bad weather conditions is less too. In addition, if the bride wants it, she can also create some more sophisticated and cool hairstyles with her short hair, going for chignons, braids, or other types of hair styling alternatives. So all you need to do now is figure out whether going for a short hairstyle is the thing you want or not and if it is, whether you have the suitable features and specifications for having impressive looks with it. This is, in fact, a great way of bringing in some image changes, but we really wouldn’t recommend going for such experiments for the first time if that first time is too close to your wedding day. The risk that you might not like the irreversible changes with your hair is big, so you’d better keep them for the days coming after if you have always been having the long and lavish locks. Still, if you are already a lucky-ducky owner of a short ‘do and if it is just the thing that matches your looks the most, you can confidently go for the variety of experiments available for such hair and shine with your special and creative looks on that special day!